When another driver backs into your car, you are the one who is always on the wrong side. This is often the opinion of most insurance companies and police officers. What if you had a dash camera on the windscreen? The story could be different. Dash cams can protect you finances, your time and even scare off dishonest people who want to take advantage of an accident situation. However, you can only enjoy the benefits of a dash cam if you go for the best. We took a sample of 20 dash cameras on a test drive on the streets of New York from Manhattan to Connecticut. We then came up with a list of eight best cameras based on price category. Mobius ActionCam is discreet with high-end features that bring out quality images. The cam is small enough to fit on a keychain, which makes it a perfect choice for a driving hobbyist. You can easily attach it to your car and even remote control panels. It has a 1920 x 1080 resolution with 116 degree viewing angle. In order to use it a dash camera, you will use the inbuilt software in the camera and configure it with your Windows computer. For this, you will have to purchase a Mini-USB cable for it to work perfectly. This is a good choice for a driver who is looking for a camera with fancy features. It has an accelerometer that can save all the footage when it detects a collision. The camera has inbuilt features that alert you when the car moves from its lane, or when you need to turn on the car lights. The cam will also warn you about an imminent collision and when you are about to enter a stop. It is slightly bigger and uses a capacitor instead of a battery for power. This enables it prevent overheating and prolongs its life. 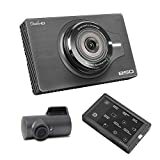 Most dash cams are meant to record events before and after an accident, but Cobra Drive HD 900(CDR900) takes the whole experience a notch higher. 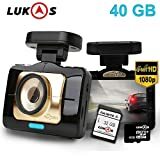 The manufacturer discovered the entertainment potential of dash cams and came up with a camera that can allow you transfer videos to your smartphone or personal computer using a Drive HD app. It also gives you an option to upload the recorded videos to YouTube or social media platforms. 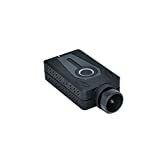 This dash cam has all the standard features required including a 126-degree angle lens with a dual WDR light correction. The camera has a touchscreen that has 3.5 inches span, which is a large size for a dash camera. You can mount the camera on the screen using 3M adhesives instead of suction. It also comes with a 32GB memory card, but it can support up to 128 GB memory. It’s called hybrid because it has a separate rear camera that gives detailed view of the traffic. It is a front and rear recording dash cam with a 3.97-inch touchscreen. It records 1080p images with a frame rate of 30fps for the front camera and 24fps for the rear cam. The front and rear cameras record simultaneously with no gaps between the files. 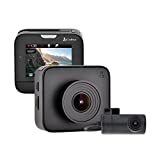 The dash cam also has ODB-II support that allows you to record the steering wheel angles, the position of the gears and the condition of the brake pedals. It can take two memory cards that have a storage capacity of up to 256 GB.